The reserve in February 2004. This is a long 150m x 10m rectangular site adjacent to Hawthorne Canal within Richard Murden Reserve, Haberfield, north of Marion St. 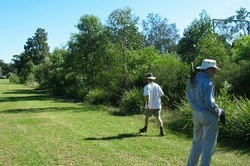 It is owned by Ashfield Council and was established in September 2000 as part of the Olympic Landcare project. This reserve is public open space owned and maintained by the council. IWEG is no longer responsible for this site which has been taken over by the Greenway Bushcare group. 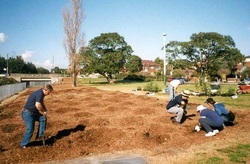 Working bee details are available on the Greenway website. When work began in 2002. About 27 local-provenance species have been planted there including Grey Ironbark (Eucalyptus paniculata), Turpentine (Syncapria glomulifera) and Swamp Mahogany (Eucalyptus robusta). Much of the tube stock planted in March 2000 is now well established, with some grasses self seeding, such as Weeping Grass (Microlaena stipoides). Possibly due to the larger established trees and proximity to water the site attracts a large diversity of birds, including the Sacred Kingfisher (Todiramphus sanctus), Brown Goshawk (Accipiter fasciatus) and Superb Blue Wren (Malurus cynaneus). 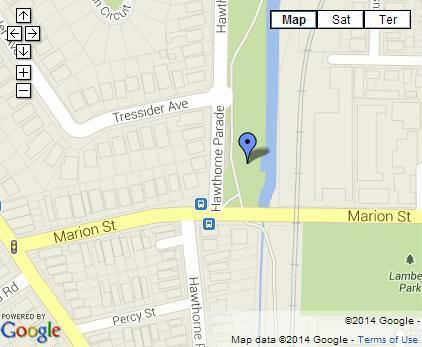 Access is via Haberfield Parade or Marion St.